Our private Colosseum tour brings Ancient Rome vividly to life as you embark on an unforgettable journey into the distant past, reconstructing the glory of the antique world's greatest city through its imposing ruins. 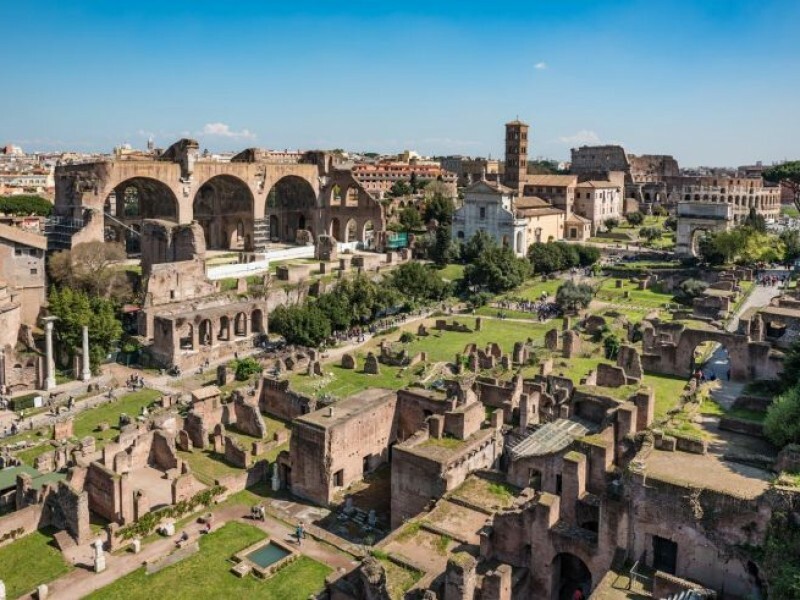 Exploring the Colosseum, the Forum and the Palatine Hill, you’ll tread the very ground where mighty emperors, fearsome gladiators and great orators made their mark on the ancient world and wrote themselves into history. 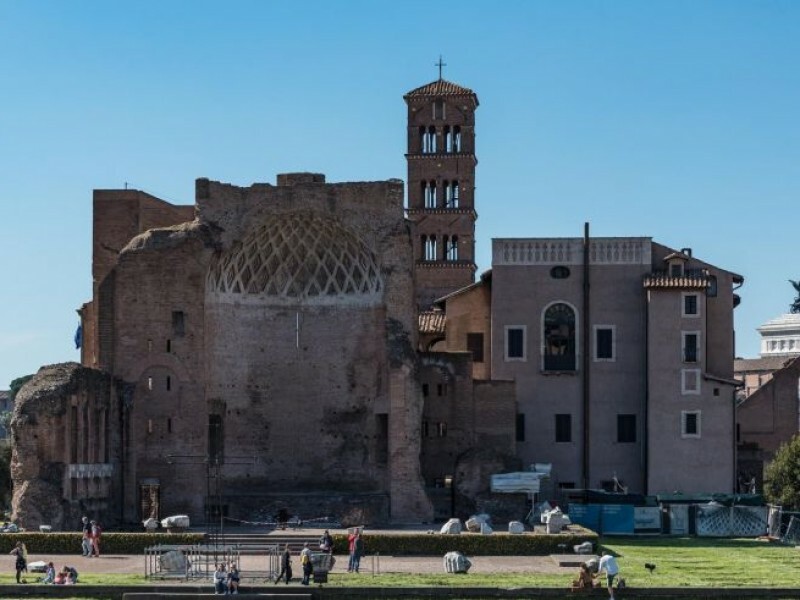 With the help of our expert guide you'll be able to make sense of what you see, in the spaces that were once the political and religious heart of Rome. At the heart of our tour is the spectacular Colosseum, wonder of architecture and a miracle of engineering even today. The deadly spectacles of life and death that took place there were wildly popular, and to understand why we’ll have to get into the minds of the ancient Romans themselves. Recreating a day at the games, we’ll practically hear the distant roars of the beasts in the arena and the screams of enraptured crowds. In the magnificently preserved Roman Forum nearby your guide will weave tales of political intrigue, betrayal and murder worthy of a Hollywood thriller. Learn about the assassination of Julius Caesar and Cicero’s tragic end; discover the religious rituals of Ancient Rome in front of great temples, and relive the inspiring speeches of Roman rulers in the Senate. 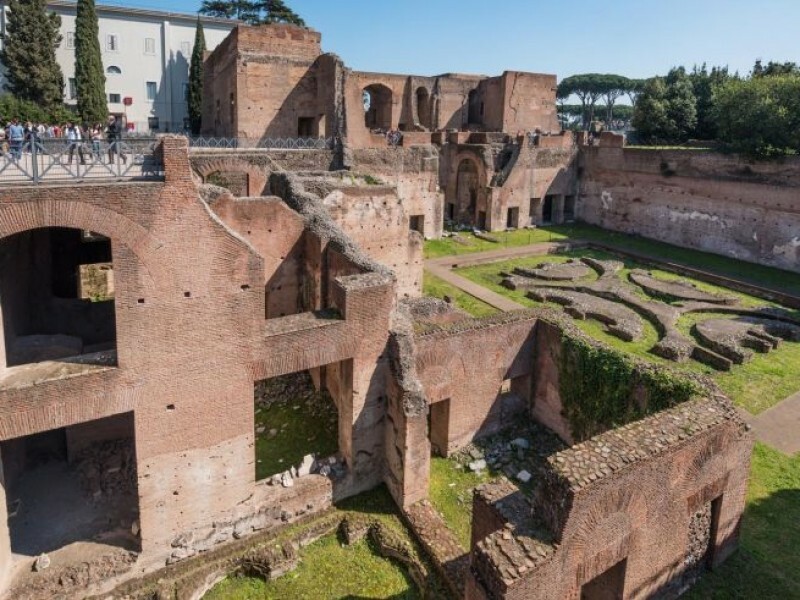 Wander through luxurious Imperial palaces on the leafy Palatine hill, and learn about the incredible excesses of fabulously wealthy emperors drunk on power. As the spellbinding panorama of Rome spreads out all before us from this spectacular vantage point, see how Rome’s past still lives on in the city today. Just entering the Colosseum is an event in itself, but our private Colosseum tour takes things to another level, transporting you back to the gladiatorial games of Ancient Rome and situating them in their historical context. We’ll help you make sense of these vast structures and the incredible ancient engineering techniques that made it possible to build the amphitheatre in just 10 short years. The guides we entrust with leading our private Colosseum tours are all experts in their fields, many of them trained archaeologists. They’ll provide fascinating insights into who the gladiators were, where they came from and their punishing training regimes. You’ll also find out what happened when they stepped onto the floor of the amphitheatre for what was often the last time. You’ll learn about how the fights were staged and discover the complex mechanical infrastructure of the arena (including trap doors and elevators), which made the spectacles of death a dramatic reality. Thanks to recent excavations and archaeological research we know more about the Colosseum than ever before, and our itinerary will clue you in to the latest research in as you discover the secrets of the Flavian Amphitheater. You’ll learn about fascinating details like the Velarium, a kind of awning that covered the seating area which was operated by sailors, or how the Colosseum could be flooded to allow chaotic naval battles to be staged there. You private guided visit of the Colosseum will take you through the events of a whole day at the games around the arena, entering the world of the ancient Romans and gaining a vivid insight into their social and political life. Of course your guide can personalise the itinerary to suit your interests – curious whether you need to take Hollywood movies like Gladiator with a pinch of salt? Did emperors really join the deadly frays in the arena? Find our with our expert guides! The daily life and politics of Ancient Rome underwent dramatic changes during the shift from the Republic to the Empire with the emperor Augustus, at the end of the 1st century. The relation between the citizens of Rome and the politicians of the Republic, who had mostly been elected, changed completely. The emperor became the centre of all political power, and the only point of reference. The Romans would go to the Colosseum to show their support for their emperor. The emperor used the spectacles at the Colosseum to demonstrate his commitment to the public, the strength of his political campaigns in distant parts of the empire, and his undisputed authority - now based on the law of the strongest. Our Colosseum private guided tour will reveal how the gladiatorial combats in the arena of the Roman Coliseum played an important part in uniting a complex and turbulent empire, a multitude of languages and ethnicities dominated by the greatest metropolis in antiquity - Rome. We our 19 years of experience, and a dedicated team of guides, mostly expert archaeologists, keen to share their knowledge with you, we can guarantee you an enjoyable, stress-free tour, as we take care of purchasing skip the line tickets for your private itinerary. As well as the best private Colosseum as we have carefully optimised it through the centuries on the basis of our experience and the thousands of feedback we have received from you over the years. Your tour lasts 4 hours because this is the time needed to enjoy and experience the vast archaeological sites of the Colosseum, Roman Forum and the Palatine Hill, at your own pace, spending more or less time at each site according to your preferences. Instead of hurrying through the most famous sites of Ancient Rome, we want you to enjoy and understand the significance of these famous sites in the wider context of Rome and its history, as well as exploring some exclusive, less famous sites. The VIP experience is guaranteed on our tour; you will decide how long to remain in the garden of the Vestal Virgins, learning about their unusual lives, or gazing at their statues. Depending on your interests, we can explore the political or economic themes of the time, or learn about religious rites, or discuss the scandalous love affairs of cultured, emancipated women of the 1st century, such as Julia, daughter of the emperor Augustus. In addition, our guide will take you to panoramic viewpoints to take photos of the impressive imperial ruins, as well as spectacular views of the Colosseum and the valley of the Roman Forum from above, giving you an unparalleled view across Rome. The wide valley of the Roman Forum was the political heart of Ancient Rome. In this labyrinth of temples, buildings and streets of incomparable beauty, history is everywhere, and there are infinite ancient stories to be uncovered. 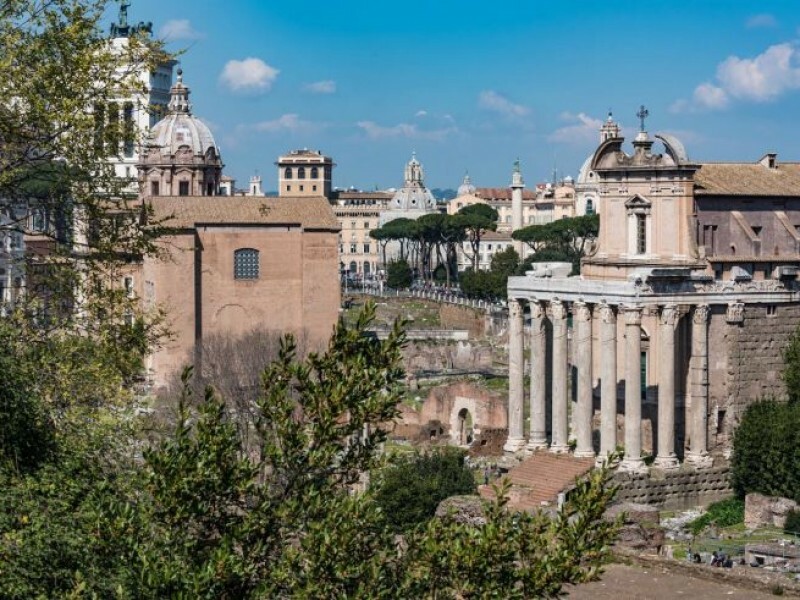 Your private tour of the Roman Forum will be a journey to discover and learn about how this valley grow in importance through the centuries to become the political and religious heart of Rome form the 5th century A.D. onwards. Your personal guide will help you to envision Rome of the 1st century AD, a bustling city which reached a million inhabitants. Walking through the cobbled streets of the Roman Forum, your dedicated guide will put together the pieces of this fascinating puzzle of ruins. We will bring you into the Senate, the imposing symbol of the Roman Republic; S. P. Q. R. symbolises the famous pact between the people and aristocracy of Rome. Our knowledgeable guide will introduce you to the senators, their speeches, and the debates recorded by the historians of the time, as well as the crucial events that led to the unstoppable conquest of the Mediterranean. You’ll also discover the secrets of Roman religion in the atmospheric ruins of the House and Garden of the Vestal Virgins, learning about the privileged yet often tragic lives of the priestesses. The Basilica of Maxentius with its colossal arches gives us a fascinating insight into the achievements of ancient architecture and the important trials which were held here and attended by hundreds of Romans. Just think that the famous speeches of great orators such as Cicero and Julius Caesar echoed through these halls. Exploring the temples of the Forum, including the awe-inspiring Temple of Saturn (connected to the foundation of the Republic) and the Temple of Castor and Pollux, is the perfect way to learn about the Roman gods and religious rituals. The grand temple of Antoninus and Faustina is made even more intriguing by its surprising history; over the centuries it was converted into a church, creating a spectacular architectural hybrid. 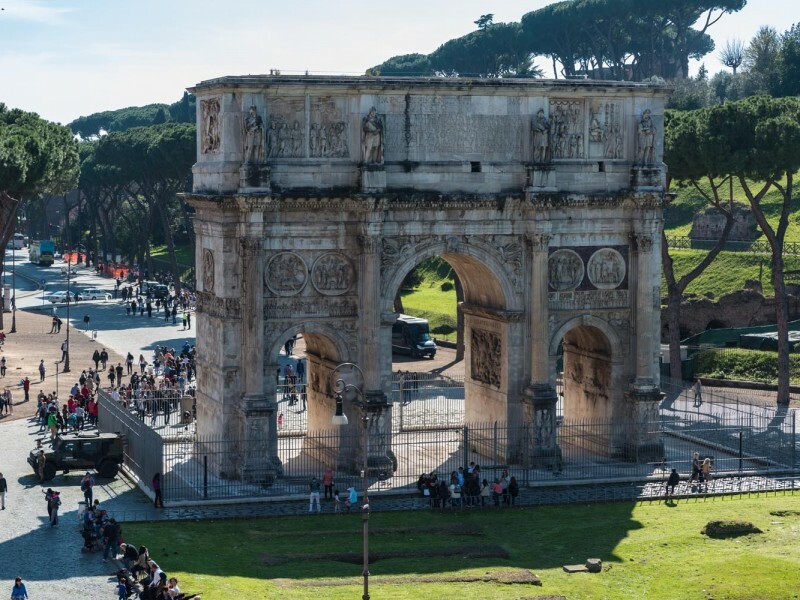 On our Roman Forum Tour you’ll hear stories of the triumphal parades that took place on the Via Sacra, where you can still see the wheel-ruts of the carriages, and you’ll have the opportunity to walk in the footsteps of the Romans, all the way to the Arch of Titus. This magnificent arch vividly depicts the triumphs of the Roman Empire in Jerusalem. Along with the Arch of Septimius Severus at the other end of the Forum, it gives us a fascinating glimpse into the grandeur of Ancient Rome. The triumphal arches are covered with inscriptions and bas-reliefs; these stories immortalized in stone are the predecessors of our war films and victory celebrations. You’ll also explore the places where some of the most important events in Roman history took place, such as the funeral of Julius Caesar and the decapitation of Cicero. In the 16th century the Roman Forum, by now abandoned, was the place where shepherds tended their flocks in the open, amongst the vast ruins. The rediscovery of the archaeological sites through the centuries, the passion for antiquities which spread contagiously from Renaissance onwards, it’s a fascinating story that will be revealed by your personal guide. Then it is time to climb up the Imperial Ramp to reach the Palatine Hill. There’s so much to discover on the beautiful Palatine Hill. With its strategic position high above the city, the Palatine offers spectacular views of the Tiber, the Circus Maximus, the Roman Forum and the Colosseum, and has preserved human settlements from more than 3,000 years ago. Our private tour of the Palatine will allow you to discover some of the most significant sites in Ancient Rome, mostly overlooked by other tour companies. The explanations of our expert guide will enrich your appreciation of its gardens and palaces, banquet halls and the porticos. The history of Rome began on the Palatine Hill, and it is here that we can see the remains of huts dating to the period of Romulus and Remus, and learn about their fatal contest for the foundation of the city. It’s no surprise that this legendary hill later became home to Roman aristocracy and emperors, including Augustus and Tiberius. This part of our walk will focus on the private lives of the Romans, just as the dominant theme of the Roman Forum was public life. You’ll explore the vast Flavian Palace, the Baths of Septimius Severus, and the Stadium of Domitian. As you walk through the impressive ruins of the palaces, your expert guide will share stories of the lives of the emperors, and show you exquisite frescoes, mosaics and statues. We will then retreat to the shady Farnese Gardens and learn about the Renaissance response to antiquity, when this area was rediscovered and divided up by influential families of the time. A tour of the Palatine Hill is as an educational experience, but it’s also a chance to relax, and to enjoy the peaceful gardens. This is a walking tour through archaeological sites with steps and uneven surfaces. Cinzia was an excellent guide and we enjoyed our day with her immensely! She was so personable and she had that wonderful talent of bringing the past to life in an amazing way. The day flew by and we felt like we were saying goodbye to an old friend at the end of the day. We all would HIGHLY recommend her for any tour-she was wonderful!! !